The alarm accidentally went off at 5:00 am, the same time it usually does every weekday morning. Reaching quickly to stop the shrilling sound, I felt a cool sense of ease knowing I didn’t have to get up if I didn’t want to. Of course Lucille, my golden retriever was now sitting beside the bed panting and looking at me with that hopeful gaze. She had different ideas, and preferred I didn’t sleep in on my birthday. Getting up, I carefully shut the bedroom door trying not to wake my wife TBBW. I went outside onto the deck and collected my thoughts. It was still too early for some of the projects that needed to be done, and the cool summer breeze wasn’t going to last too long today… So I loaded some tunes on my MP3 player from two of Carolyn Wonderland’s CD’s; Miss Understood from 2008 and an earlier one entitled Bloodless Revolution. I grabbed Lucille’s leash and we headed out on our morning jaunt. My thoughts then turned to how impressed I was with Wonderland’s talent and driving energy. And how lucky people seeing her perform at The San Jose Jazz Fest on Sunday August 15th were; especially those who may be unfamiliar. Wonderland is an outstanding and versatile artist. Not exactly a stranger to the music world, (especially around Texas) she has developed into an incredibly talented singer, songwriter and guitarist who can definitely groove. Along the way Wonderland has generated fans like Bob Dylan and Ray Benson, founder of Asleep at the Wheel. She has been a collaborator with Benson for many years, and he produced her latest CD Miss Understood. Wonderland also gives credit to Austin singer/songwriter Terri Hendrix for inspiration and covers two Hendrix songs on the album. Carolyn likes to weave different styles from the blues, to country, soul, gospel and some swing to her repertoire; creating catchy soulful tunes along the way. Born Nov 9th, 1972 in Houston Texas, she first started writing songs while in elementary school at the age of eight. Growing up with music in her blood, Carolyn picked up her mother’s forbidden Martin guitar whenever she’d get the opportunity; further cementing her passion. 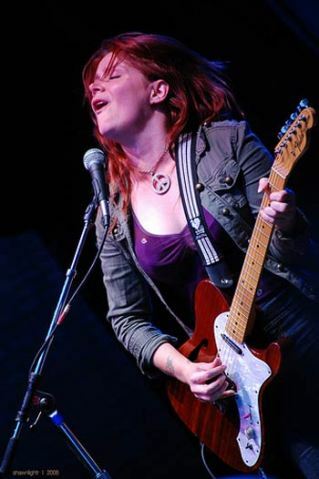 Over the years Wonderland has toured with blues greats like Buddy Guy and Johnny Winter, and jammed with mentors and friends like Bob Dylan, Eddy Shaver and Ray Benson. She’s also co-written songs with Ruthie Foster, Candye Kane and Guy Forsyth. Wonderland’s virtuosity has earned her an appearance on Austin City Limits. Carolyn has also had her music used on NBC’s “Homicide” and Fox’s “Time of Your Life.” At the 2007 inaugural Road To Austin festival, she was accompanied by Bonnie Raitt, and performed to high praise with Kris Kristofferson and Delbert McClinton, backed by Stephen Bruton’s all-star band. is a 23 year old mission-driven arts organization that produces culturally diverse performance and educational programs designed to build a stronger, more vibrant cultural atmosphere in San Jose and the Silicon Valley. In 1989 the organization produced its first jazz festival, and in 1993 produced its first youth education program. Today the organization is a well-managed, year-round arts organization that produces 9 educational and 4 performance programs annually. San Jose Jazz brings music to over 5,700 school children a year, and produces hundreds of concerts and events. With this year’s festival and the many acts it features, including class performers like Carolyn Wonderland, the future has never looked brighter. If you’re in the San Jose area next weekend, make sure you stop by The Blues Stage on Sunday August 15th and catch Carolyn and her band. The music from this morning’s outing continued to play as I walked back into the house. While taking my earphones off, I looked up and there was TBBW and my son smiling and waiting with a fresh cup of coffee and a small gift in hand… Taking a sip of my coffee, you could hear Lucille take a deep expressive sigh of relief as she found a cool spot on the kitchen tile to chill. Hmm, perhaps the alarm this morning wasn’t an accident after all. Is there anyone who is going to the San Jose Jazz Fest next weekend? Are you planning on stopping by and catching Carolyn Wonderland? If you are, I’d love to hear your comments regarding the show or her music in general. Wow great!!! She rocks!! Thanks BB! Whoa! She’s not just another chick singer…thanks for bringing this to us. wowowow She is great … she rocks !!! great find , thank you The Blues Blogger…. Great write up!!! having been lucky enough to see her in Austin a few times a word of warning, seeing her live is a highly addictive experience!